Named for: Confederate States Army General Thomas J.
Thomas Jonathan Jackson born at Clarksburg Va. (now in W. Va.) in 1824 was orphaned at an early age; but through sheer determination he acquired a basic education and won an appointment to the United States Military Academy at West Point. He graduated in 1846 and acquitted himself so well during the Mexican War that he was breveted to the rank of major within 18 months. He resigned from the Army in 1852 and became professor of artillery tactics and natural philosophy (physics) at Virginia Military Institute. At the beginning of the Civil War Jackson was appointed colonel of Virginia troops and placed in command at Harper's Ferry. He was promoted to brigadier general on 17 June 1861 and quickly brought his command to peak efficiency. At the First Battle of Manassas as a Federal assault shattered itself against his troops he became "Stonewall" Jackson when Brigadier General Bernard E. Bee exhorted his own troops to reform by shouting "There stands Jackson like a stone wall. Rally behind the Virginians!" then withdrew south to check Fremont's forces at Cross Keys and Shield's troops at Port Republic. At this point General Robert E. Lee (q.v.) who had recently succeeded to command of the army standing before Richmond summoned him to join in the Seven Days Campaign. The Seven Days Campaign ended with the Battle of Malvern Hill on 1 July. McClellan's army withdrew from the Peninsula soon thereafter and Lee's army concentrated on Pope's forces. After two months of inconclusive skirmishes and maneuvers Jackson opened a new campaign in late August when he led his "foot cavalry" on the most famous of all its "rides" and destroyed the Union base at Manassas Junction. During the ensuring Battle of Second Manassas Jackson was instrumental in overwhelming Pope's army and led the resulting advance into Maryland. He took Harper's Ferry on 15 September and distinguished himself at the Battle of Antietam Creek two days later. After its withdrawal from Maryland the Army of Northern Virginia was reorganized into two corps with newly promoted Lieutenant General Jackson in command of the 2d. His able leadership based upon ability and strict discipline was demonstrated again at Fredericksburg where the Army of Northern Virginia scored another resounding victory in December 1862 this time over General Ambrose Burnside. pickets. Jackson was severely wounded. Weak from the wound he contracted pneumonia and died eight days later. Jackson's death a severe loss to the Confederate Army deprived it of one of America's greatest soldiers. Stonewall Jackson (SSBN-634) was laid down on Independence Day 1962 at Vallejo Calif. by the Mare Island Naval Shipyard; launched on 30 November 1963; sponsored by Miss Julia Christian McAfee; and commissioned on 26 August 1964 Comdr. J. H. Nicholson and Comdr. R. A. Frost commanding the Blue and Gold crews respectively. Stonewall Jackson got underway from Vallejo on 3 September for her shakedown cruise to Cape Kennedy Fla. The Blue crew completed training with a successful missile firing on 2 December and was relieved by the Gold crew. Following the Gold crew's successful missile launch on 16 December Stonewall Jackson returned to the Pacific Ocean to complete shakedown operations. The fleet ballistic missile submarine (FBM) entered post-shakedown availability on 13 February 1965 then made final preparations at Bangor Wash. for overseas movement. In April she began her first strategic deterrent patrol. In June 1965 the Gold crew relieved the Blue crew at Apra Harbor Guam and for the next five years the submarine conducted deterrent patrols from that port. In the spring of 1970 Stonewall Jackson was reassigned to the Atlantic Fleet. On 23 April she got underway from Pearl Harbor to conduct a special operation before continuing on to the Panama Canal. She transited the canal on 7 May and changed operational control from Submarine Flotilla (SubFlot) 5 to SubFlot 6 officially joining the Atlantic Fleet. Eight days later she put into New London Conn.
She spent the second half of May in upkeep at New London; then headed south on 1 June. The submarine stopped at the Naval Academy from 7 to 10 June for midshipman indoctrination tours then put to sea for special operations. Stonewall Jackson entered Charleston to off-load missiles during the first week in July; then shaped a course for New London arriving on the 10th. 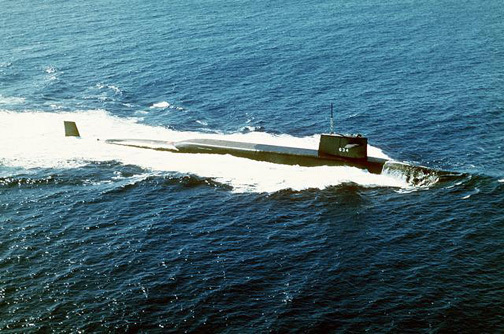 On 15 July she entered the shipyard of General Dynamics Electric Boat Division at Groton Conn. for conversion to the Poseidon (C-3) missile system The installation of the new missile system was completed by 29 October 1971 when the Blue crew began preparations to put to sea. Between October 1971 and March 1972 both Blue and Gold crews conducted their shakedown cruises off the southeastern coast of the United States. She returned to Groton on 4 March and on 8 March commenced post-shakedown availability at the General Dynamics shipyard. On 7 April she got underway for Charleston for a missile load-out in preparation for her first post-conversion and first Atlantic deterrent cruise. Since that time she has operated out of the advanced base at Holy Loch Scotland alternating Blue and Gold crews on deterrent patrols.